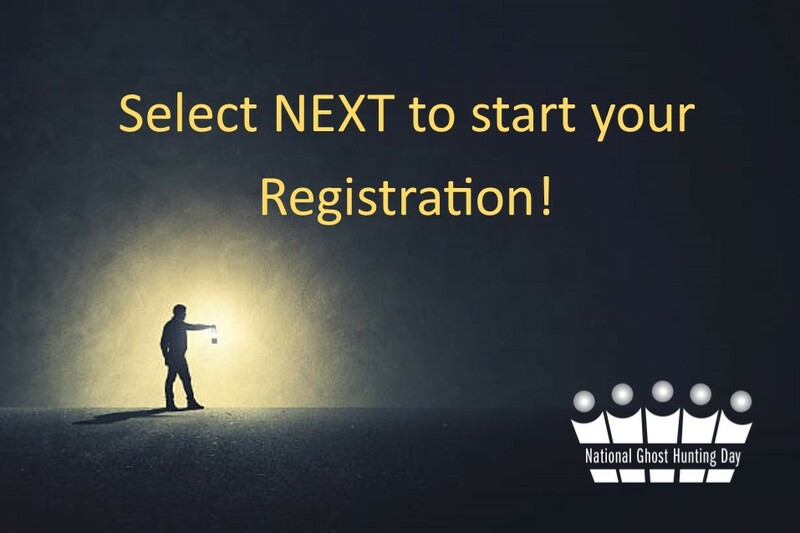 World's Largest Ghost Hunt 2019 Registration! Uniting Haunted Properties and Ghost Hunting Teams around the world! In 2019, the World's Largest Ghost Hunt will continue to honor and support Historic Preservation. But this year, it will be on steroids! We have made relationships and associations to other amazing organizations, partnering with us for a spectacular annual celebration! Collectively as one, we will devote time and effort as volunteers, to raise funds for the preservation of historical property who are at risk. In addition, we will be sharing the history of these properties while promoting them to the world! "A Haunting is History Wishing To be Heard." and so the world can hear your history! 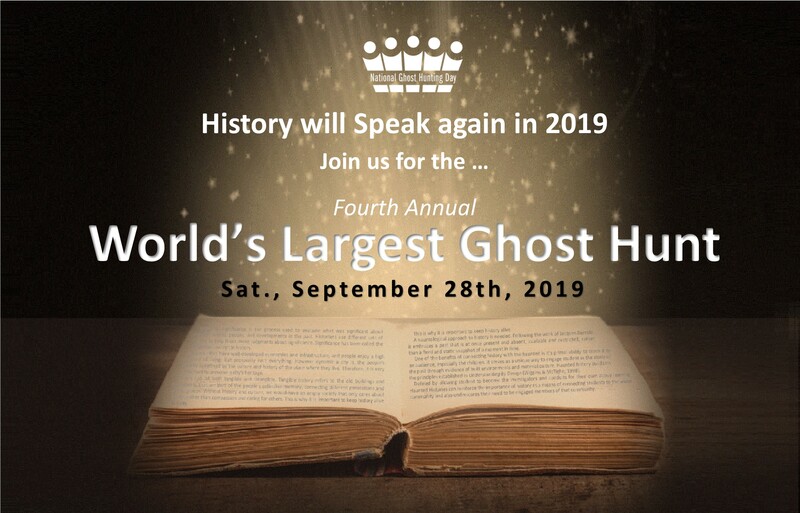 In honor of the 4th annual National Ghost Hunting Day, join the "World's Lorgest Ghost Hunt" on September 28, 2019 and be part of an amazing Haunted History movement! This epic event is simple. Two-hour Paranormal Investigations will be held simultaneously throughout the world. Why not bring your hometown into this historic event? Last year, in 2018, over 150 properties around the world registered, representing 14 countries on six continents. All locations were united as one to hold the most incredible paranormal investigation ever performed. "Shot Gun Start"; Please adjust to your specific time-zone. Although we are a non-profit social integration organization, governed under the by-laws of the newly founded, Historic Haunted Preservatory™ organization, we must be responsible to the costs of executing this project. For this reason, we have established a small fee of $50.00 per USA Based team/locations (combined) that will be used in its entirety to produce and deliver this fund raising project. International Teams are waived the fee. We are certain that those that have had a history of working with us, will see that this is a nominal fee for the benefits that are returned to the haunted locations/teams. How may locations for 2019? We will limit to 200 Locations. Celebrating the cultural diversity in ghost hunting practices and acceptance worldwide. What is your full name? * This field is required This should be the name of the principle contact person for your team/location. What is your Email Address* This field is required This should be the Email Address for the principle contact person for your team/location. A Paranormal Investigation Team to help manage the local event and conduct the ghost hunt. Both will be partners in conducting the event! This form MUST be completed by the Historical Property's or the Ghost Hunting Team representative, AFTER all location has been selected and confirmed. This year the event is limited to 200 locations. We will follow up with you with more details to assure there is a good fit between the historic property and team. When available, confirmation with the historic location will be done. The fee will be collected when the registration is recieved and confirmed as active. Once the fee is received, the team/property will be officially confirmed as being part of the the 2019's World's Largest Ghost Hunt. Do remember, all properties will keep 100% of attendees donations from spectators that attend the property's ghost hunt. 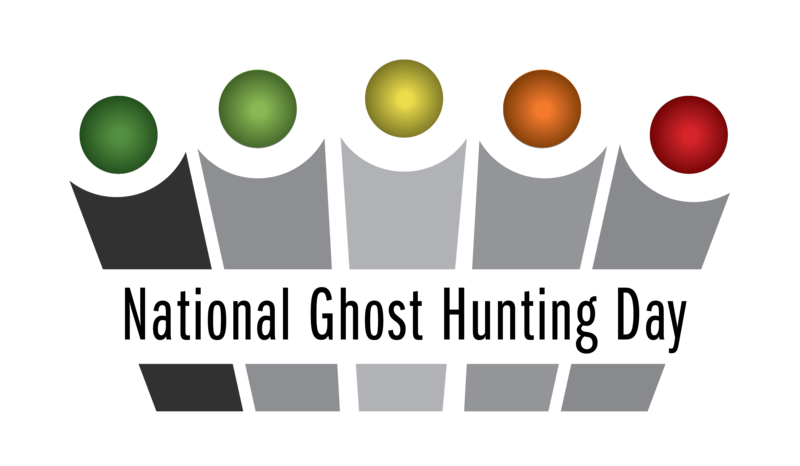 Ticketing for the event will go through an established ticketing agency (Thriller.Events) so that we can track sales and help optimize its promotion and sales. Are they aware and consent to participation? By completing, signing and submitting this registration you (and your partners) affirm and promise that you are participating in this event with honesty and integrity to the cause, mission and purpose. You and your partners take full responsibility and accountability in abiding to the Codes of Conduct and Ghost Hunting best practices. All these are found clearly in the National Ghost Hunting Website. In addition, you and your partners will not hold any liability against the directors or members of National Ghost Hunting Day's Advisory committee, Sponsors, Participants, World's Largest Ghost Hunt, and/or Haunted Journey for any injury or harm to yourselves (or those with you) endured before, during or after this investigation. TO CONFIRM, PLEASE SIGN ON THE NEXT SLIDE.